If you’re moving, you get the pleasure of packing up your entire space. You’ll get to go through things you didn’t even know still existed. Your childhood cast? Check. Your report card from fifth grade? Yep. So, if you’re moving out from your parent’s house, going to college, or relocating, you’re going to need to know the best tips for packing your coveted vinyl collection. Don’t show your family heirlooms any disrespect, and pack them up appropriately for your local moving company. Protecting your collection from heat, moisture, dust, and time will be a lengthy—but a worthy—endeavor. In addition to an acid-free liner and sturdy jacket, arm each and every record with a poly sleeve, so it will stand the test of time. Removing the jackets from all of your records may appear to be tedious and counter-intuitive, but many professionals suggest this because it prevents the jacket from being imprinted with the vinyl’s discolored ring. To prevent this, remove the jacket and place the record beside it, in its acid-free paper, and bundle it all together in a poly sleeve. What are they going in? Choosing the right container to pack your vinyl in, is just as crucial as how to protect them. Using a cardboard box is suitable, taking note you purchase ones that are 14”X14”X14 in dimension. If you’re able to, avoid a box with excess room to mitigate your records from bouncing around. A good tip is packing them in milk crates (they fit perfectly) and then packing that into a box or plastic bin. You don’t want to fool around with an inexperienced or flippant moving company with your precious collection. 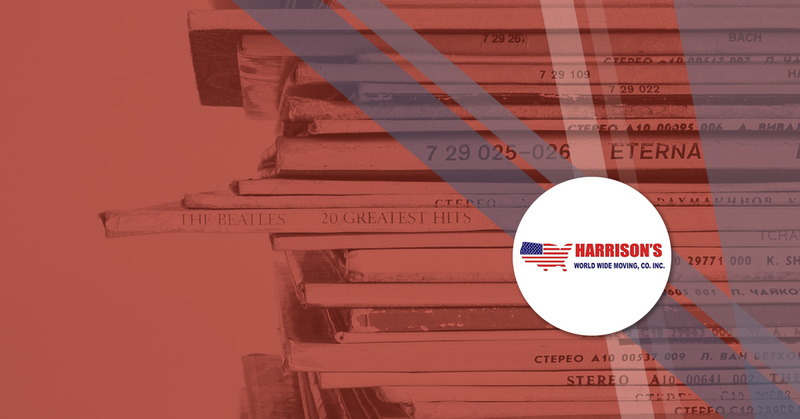 Trust your vinyl’s with Harrison Moving, Tidewater’s trusted moving company that has been moving records since 1956! Book with Harrison Moving today!